Costa Rica has long been recognized for its world-class Sport Fishing, and Manuel Antonio Sport Fishing is any anglers dream! Discount fishing charters. For inshore fishing, Quepos is where it is at. The area offers some feisty fighters, like Snapper and local Rooster Fish in the heavy weight category, weighing up to 70-80 pounds! Our Manuel Antonio freshwater mangrove fishing is perfect for those who want to reel in a big one while navigating through incredibly dense wildlife. If looking for your next sport fishing adventure, Manuel Antonio & Quepos Sport Fishing are up to the challenge! Are you ready get a big one on the line? Whether it´s your first time with a rod and reel or you´re an advanced angler, this Costa Rica freshwater fishing excursion is an once-in-a-lifetime experience. Never fished before? Don´t worry! You´ll get a quick lesson to cover the basics & our professional guides will provide you with all the help you need. 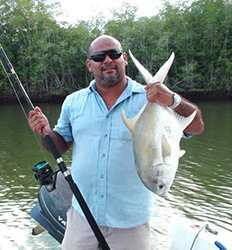 Manuel Antonio Freshwater Mangrove Fishing deposit is $75.00 per boat.